June 13, 2008 by KimmChi in "Brooklyn Flea", "Brooklyn Indie market", "Renegada Craft Fair", "classes"
Have we got Indie for you this weekend! 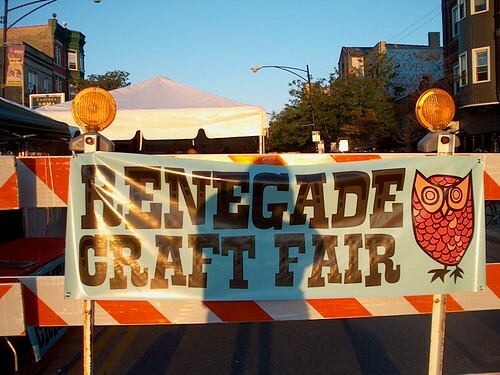 Renegade hits town this weekend on June 14 and 15 at the McCarren Park Pool in Williamsburg (L train to Bedford Avenue). We have a couple of vendors that will be keeping it real under their tents in the pool. Cakehouse will have her unique silkscreened housewares made from recycled vintage material into placemats, coasters and napkins. Metalsugar will be there with her fun line of jewelry from rubber chicken and necktie necklaces to cupcake signet rings - YUM! And BetterThanJam will also be there with her line of silkscreened dresses and skirts, as well as cowls, aprons and bags. For wooden bookmarks made from salvaged scrap, check out BeaconBookmarks. Also on Saturday is the Brooklyn Indie Market at Smith and Union Street, Carroll Gardens, Brooklyn, with stylish skirts by Fofolle and vintage-inspired decoupage jewelry by wabisabi brooklyn. Off of Fort Greene Park, you can find CityBitz at the Artisanal Market. SUNDAY, Renegade beats on, but on the other side of town, back in Fort Greene, Brooklyn Flea continues, reachable by bus and subway. Manning the team tent will be ikyoto, Vyphuisdesigns, DewOnAPetal, luckx4, and helenfitz. and I swear I saw Michelle Williams but who can really tell behind those over sized sunglasses, have you seen any celebrities there? Also on Sunday is the Annual Seventh Heaven Street Fair in Park Slope. They have added a special Hand made Arts & Crafts section and many of us will be there on Seventh Avenue between 11th and 13th streets. You can take the B/Q train to 7th Avenue or the F train to 7th avenue. Okay, that's everything I know about! And if you are planning your activities for the upcoming week, there are tons of DIY classes abound. Over at the Make Workshop at 195 Chrystie Street they have intro to needlepoint on Wednesday, Zipper Workshop and Beginning Crochet on Thursday, and Intro to Sewing on Friday. The Etsy labs over at 365 Gold Street in Brooklyn will host a Book Binding class on Wednesday. "Brooklyn Flea", "Brooklyn Indie market", "Renegada Craft Fair", "classes"